Let’s just assume you live in a normal part of the country where it’s not 90 degrees right now, despite the fact that it’s nearly October. If you do, you might actually be thinking that the holidays and winter are just around the corner. 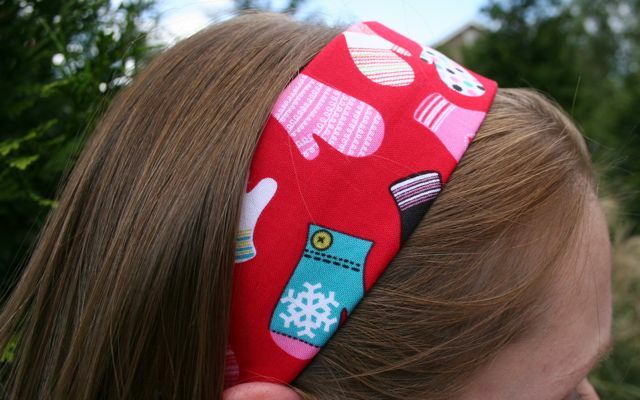 If I were lucky like you, I’d want a cute winter-themed headband to keep my hair out of my face. Because most of my life has really just been a quest to keep my hair out of my face. 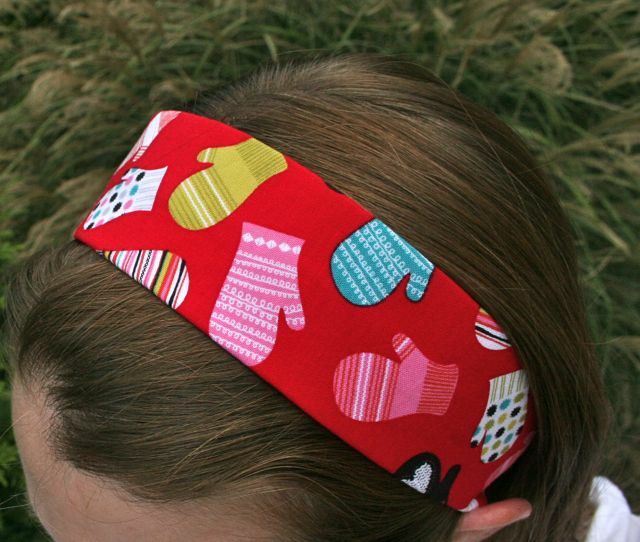 Begin with fabric for the body of the headband, and cut to 18″ x 3″. I used a quilt-weight cotton, but any fabric with little to no stretch will do. 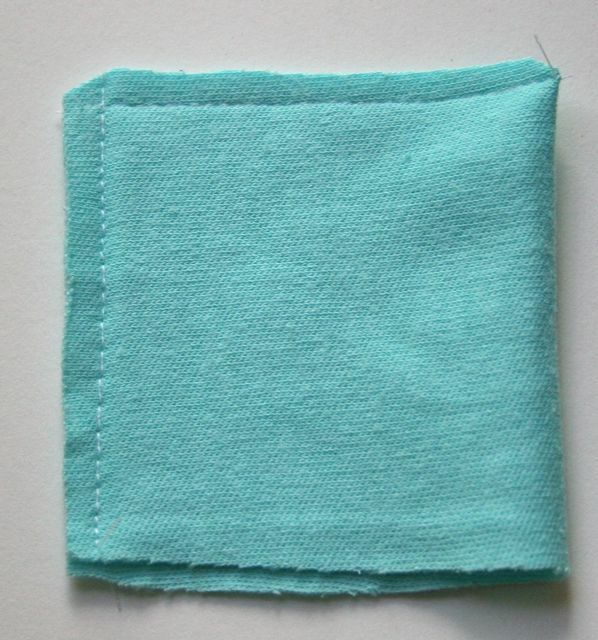 You’ll also want a square of knit fabric measuring 3″ x 3″–a scrap from an old tee shirt works fine. 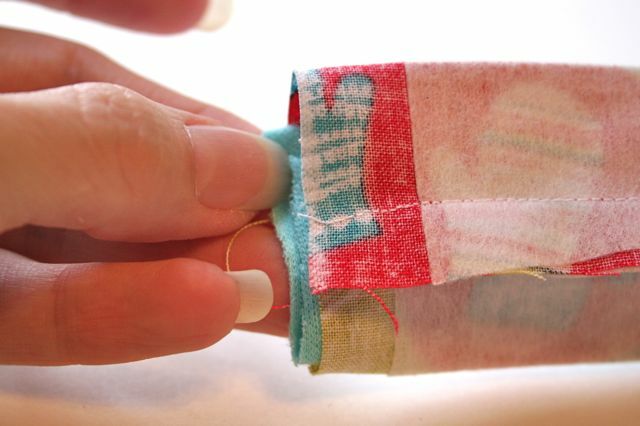 Fold your knit square in half and stitch around all three open sides. Then cut in half to make two tabs of equal length, each of which is stitched on two sides, folded on one, and open on one. 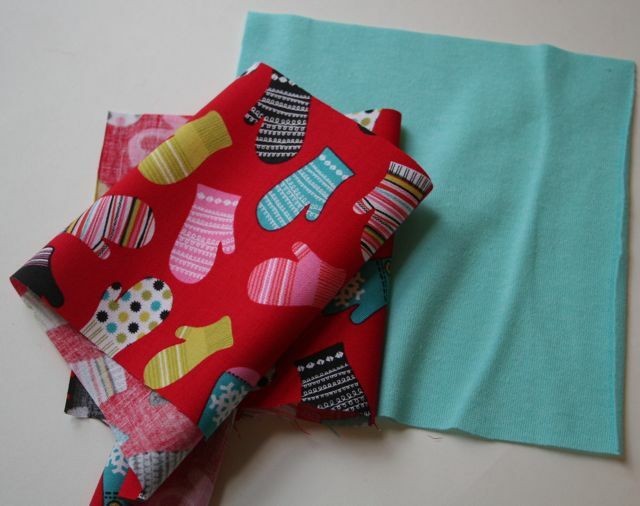 Set the tabs aside and take your main fabric over to the ironing board. 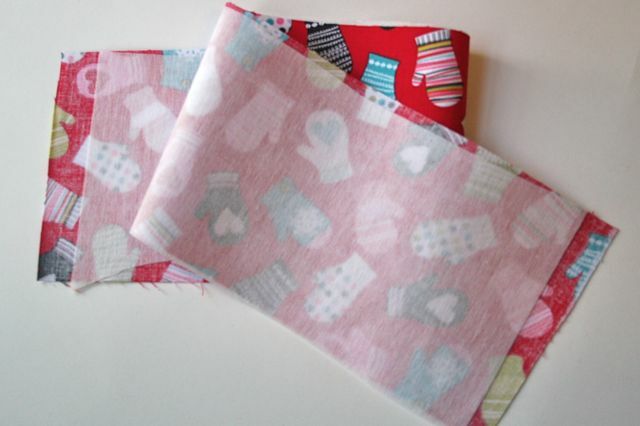 Apply a length of fusible interfacing to the wrong side of the fabric. This gives it some body and stiffness so it won’t be a quitter and slide off your head a zillion times. I hate that. Combined with the stretchy button tabs we’re going to make to hold this puppy in place, this is about to become your very favorite headband. Fold the interfaced headband in half lengthwise, right sides together, and take it to the machine. 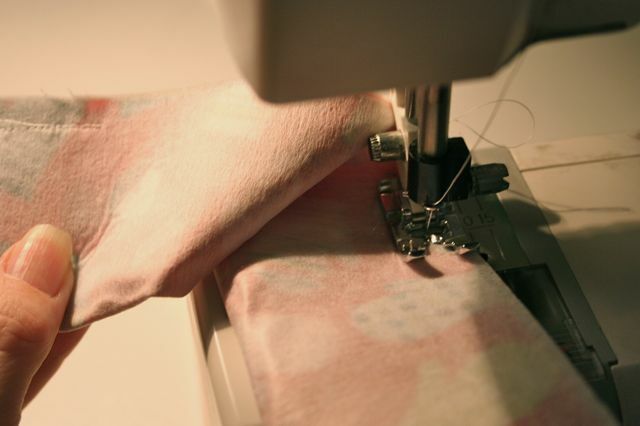 With a 1/4″ seam allowance, stitch from one end down the long edge, stopping and backtacking about 5″ down. Leave a 4″-6″ opening to turn it right side out later, and then stitch the remainder of the long edge. At this point, both the short ends of the headband are open and unstitched. Through the opening, insert one of the knit tabs inside the headband, keeping the headband seam centered and all raw edges even. Stitch back and forth across the short end of the headband, anchoring the tab in place. Repeat on the other end of the headband. Reach in through the opening you left along the long edge of the headband and flip the whole thing right side out. You’ll see the tabs pop out on either end. Press it all in place, then hand-stitch the opening shut (if you feel like it–I mostly leave them open and call it a day). 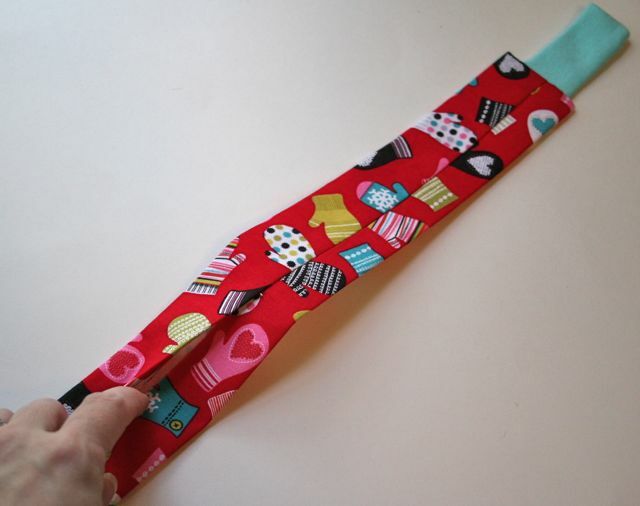 Now you head to your sewing machine and put in your buttonholes. 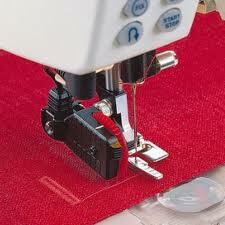 Your machine has one of four types of buttonhole function: manual, four-step, one-step, or automatic. Manual buttonholes are ones where your machine doesn’t do diddly-squat in the buttonhole department and you’ll need to make the buttonhole your own self. 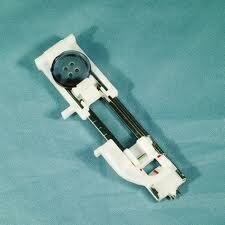 This is my old machine, which I no longer use for buttonholes. Nothing wrong with it, but I never quite got the hang of making them this way. A four-step buttonholer makes your buttonhole by asking you to adjust your knob for each part: the bead (the short, narrow zigzags on either side of the buttonhole that keep the fabric from fraying at the opening) and the bar tacks (the wider zigzags at top and bottom of the buttonhole that keep the opening from ripping beyond the size of the button that will pass through it). With a four-stepper, you’ll have a diagram on the machine that indicates which part of the buttonhole will be stitched when, and you’ll turn the knob to move between them. Your presser foot will indicate for you when and were to stop to make sure that each buttonhole is the same size. If you have a one-step buttonholer, it comes with a lever that extends below the needle bar and interacts with the buttonhole foot to tell the machine when to change directions and when to finish the buttonhole. The presser foot itself has a spot in which to insert the button so the machine knows what size hole to make. This is pretty standard on most newer, computerized machines and is pretty hot. If you have an automatic buttonholer, your machine basically makes the buttonhole for you and you’re allowed to pick the fabric. The presser foot includes a track wheel that measures the amount of fabric that has passed beneath the foot and changes direction at the correct time to make the size buttonhole you’ve programmed in. I cried the first time I saw one. Really. Regardless of what type of buttonhole you’ll be making, you’ll want to take it nice and slow and pay attention to your stitch quality. If you find that you don’t like the look of your buttonhole when it’s done or that the zigzag stitches are too far apart, feel free to stitch a whole other buttonhole right on top of the old one–before the buttonhole is opened. If you open the buttonhole, then that IS your buttonhole, forever. 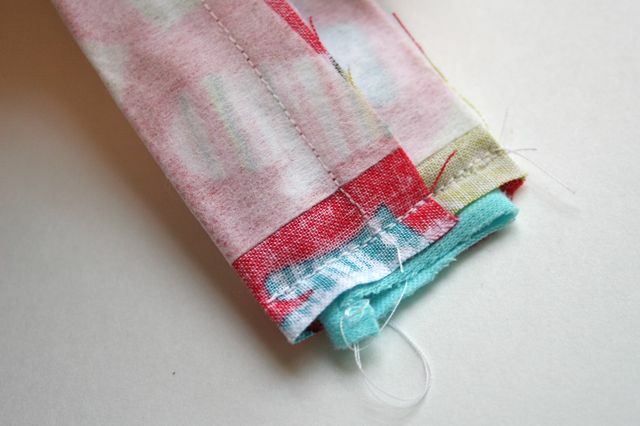 NEVER make a buttonhole on a single layer of fabric all by itself–they all need some kind of stabilization, usually from either interfacing (which stays in the project forever) or stabilizer (which can be washed or torn away after the stitching is done). In this project, we’re stitching through two layers of fabric at the same time, which can often be enough–too little fabric and the many, many tight stitches of a buttonhole will chew it right up. Stitch your buttonhole right in the center of one knit tab. Open it up either with your seam ripper (poke a hole in the middle with the tip, then use the blade in the U-gouge to open up the buttonhole) or with a pair of scissors (which I prefer when working with knits). Be super careful not to snip through the threads–that would totally defeat the purpose of putting them there in the first place. To open the buttonhole with scissors, fold in half and take a small snip at the center. Then lay flat and snip gently right up to–but not through–the bar tack at each end. Done, and done! I like this style headband a lot because, frankly, I have a headband un-friendly head: most just slip off and make me feel frustrated. The stretchy knit bands here make the headband fit better for longer, which makes me feel more secure when I wear it. The button tabs can be worn under your hair or up on top as an accessory, and are so easy to put in! Here’s hoping winter comes along soon. I think this one’s gonna look crazy cute with my Christmas jammies. ← Stitch by Stitch Book Signing TONIGHT at Whipstitch! Nice tute! Love how you go into so much detail about opening up the buttonhole, what tools to use when, etc. You’re the best! I like this tutorial! I will have a go at this kind of headband for sure. I am IN LOVE with the way my machine makes buttonholes. I was scared of them for a long time and am amazed at how easy new machines make them. One of these days I need to take a class to help my fear of zippers. Even though I have an automatic buttonhole-maker, I’ve had trouble with my buttonhole function jamming up and getting stuck. I thought that my problem was trying to put buttons too close together? It seemed like my buttonhole maker was jamming when the back of it slid over the first buttonhole? Do buttonholes have to be a certain width apart? Good to know that I need the fabric to be stabilized with layers or stabilizer. Thank you for sharing this. Button hole really intimate me, but I think I’ll try it again. Thanks for sharing. Such a super cute and easy project! I’ll definitely saving this tutorial. Thank you so much for sharing! I know I probably misread, but are we supposed to add a button on the tab that doesn’t have a buttonhole or do something else to hold the two ends together? Thanks. Yes! Excellent point–I actually got so excited about the buttonhole that I didn’t even notice I left that part out!